Computer use is an integral part of Newton Public Library activities and information resources. Use of computer stations is open to all registered Library patrons and visitors in good standing by presenting a Newton Public Library card or government-approved photo ID. Microsoft Office software is available on all public computer stations. Wireless Internet is accessible to laptop users in good standing throughout the Library. For more information governing Internet and computer access, please read Library Policies. 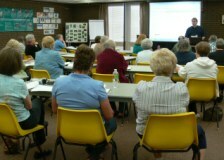 Free computer classes are offered to the public. Contact the Library for one-on-one training in the subject of your choice. Let the Library know if you would like to volunteer to offer a class to the public. Nathan, NPL IT Supervisor, gives monthly Tech Talks. Click the link to view archived presentations. Check calendar for video conference offerings to the public. Video conference equipment is available for public use, following the Meeting Room Policies and approval of a Meeting Room Application. Computers are also an integral part of many programs at NPL. Programs are free and open to the public. Check calendar for more information. Third Tuesday Genealogy meets most months at 7 p.m. on the third Tuesday of each month. Various topics are discussed with laptops available for information and learning. Fourth Tuesday Photography meets at 7 p.m. on most fourth Tuesdays to give assistance to photographers of all levels of experience in using their digital cameras. Laptops are often used to explore and learn. Photos from the group may be viewed on Facebook.